LONDON, England (CNN) -- The most lucrative match in world football took place at Wembley Stadium on Monday -- with Burnley defeating Sheffield United 1-0 to collect a prize which is estimated to be worth nearly $100 million -- more than any Superbowl or World Cup final. $100m smiles? 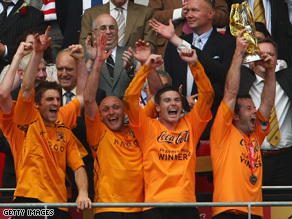 Hull City players celebrate after winning last year's Championship play-off match. In fact, international accountancy firm Deloitte say the English Championship play-off final is the richest single game in any sport. The financial jackpot for Burnley includes a $53m payment towards the coming season, and a minimum of $18m in each of the following two seasons. Dan Jones, partner in the Sport Business group at accountancy firm Deloitte, told CNN the difference between the $100m reward for the winner and what the loser receives is larger than in any other single event of any sport. "I can't think of a bigger one. People started talking about the Twenty20 for $20m cricket match when it came out -- but this is much bigger," he said. The massive injection of money to the victor is largely due to the lucrative television rights deals for Premier League football matches. Earlier this year the Premier League secured a new set of television deals for the 2010-2013 seasons worth a record $2.70 billion (£1.782b). The financial comparison between this match and the Champions League final -- which will be contested between Manchester United and FC Barcelona -- is remarkable. While a 2008 study funded by MasterCard found that the winner of the Champions League could earn as much as $149m (€110m), Jones said the financial difference between winning an losing the final would be only around $6m. "In terms of financial pressure -- if a player from Sheffield or Burnley steps up to take a penalty in that match -- they have a lot more riding on it than anyone in the Champions League would," he said. There is also potential for the guaranteed $100m to get even sweeter for the victor. Jones told CNN that in addition to the direct pay-out benefits, most clubs also experience greater ticket-sales and can attract higher advertising and sponsorship revenue. A club which managed to avoid relegation from the Premier League in the next season could gain a total of more than $100m as a result of winning the match. A club that did drop back down would still receive the "parachute payment" of $18m for two further seasons, Jones said. It's not an easy road for the team that wins this match, however. Of all the play-off match winners in the last decade, only three -- Bolton, West Ham and Hull City -- remain in the top flight. Last year's winner, Hull City, sit on the brink of relegation this weekend, and the challenge they face to stay up is the same one either Burnley or Sheffield United will get to face next season: global giant Manchester United before 80,000 people at Old Trafford. Good luck.